Total: 1 hr. 15 min. 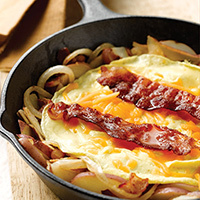 Great for a weekend breakfast or a satisfying weeknight supper. Scrub potatoes with vegetable brush under cold running water. Cut into thin wedges and place potatoes in medium saucepan with enough cold water to cover. Over medium-high heat, heat to boiling. Reduce heat to simmer, cover, and cook until tender, about 8 to 10 minutes; drain. Chop two slices of the bacon. Heat a medium, non-stick skillet over medium-high heat. Add the sliced and chopped bacon and cook until crisp, turning slices occasionally, about 5 to 6 minutes. Lift out bacon slices to paper towel and set aside. Add onion to same skillet and cook, stirring occasionally, until starting to soften, about 2 minutes. Stir in the potatoes, paprika, salt, and pepper. Cook until potatoes are lightly browned and tender, about 6 to 7 minutes. Keep warm over low heat. Over medium-high heat, heat a small, non-stick skillet. Add egg substitute, cook 1 minute, flip over and cook 1 to 2 minutes longer, until cooked through. Slide egg onto the potato mixture in the other skillet. Place skillet over medium-high heat. Sprinkle cheese over the top and sprinkle with the bacon slices. Cover and cook until the cheese melts, about 1 minute.